For wedding videographers, most of your sales will probably come from local internet searches on Google. Therefore, it is key that when people Google “wedding videographer” for your region, your website comes up on the first page. It doesn’t matter how you rank in Google’s general listings. It’s the local search rankings that matter because most of your customer pool comes from your region. The process of getting your website to show up on the first page is referred to as local SEO or Search Engine Optimization. If you did a search for “New York wedding videography”, all the websites on the first page are there because they have optimized their site for those keywords. One of the factors that Google uses to rank a website is keyword density, which means how often does a particular keyword phrase appear on each page of a website. 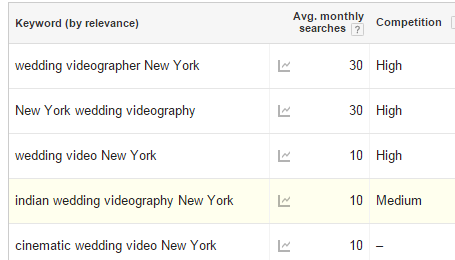 If you are trying to rank for “New York wedding videography” you would want to place that keyword phrase and different variations of it on different pages throughout your website including your blog posts, your about us section, and etc. The guys over at Moz have a great tutorial on how to do on page optimization correctly. The problem is since a lot of people are trying to optimize for the same keyword phrases, it’s very difficult to get to the first page of Google. So, in this tutorial I am going to walk you through how to find other less competitive keywords that brides are searching for on Google. Google has a tool called Keyword Planner.This tool will tell you how many people search a particular keyword phrase per month. On Google, search keyword planner and then click on the link that says Google AdWords: Keyword Planner. You will need to make an AdWords account to use this tool. Once, you are logged on, click search volume. 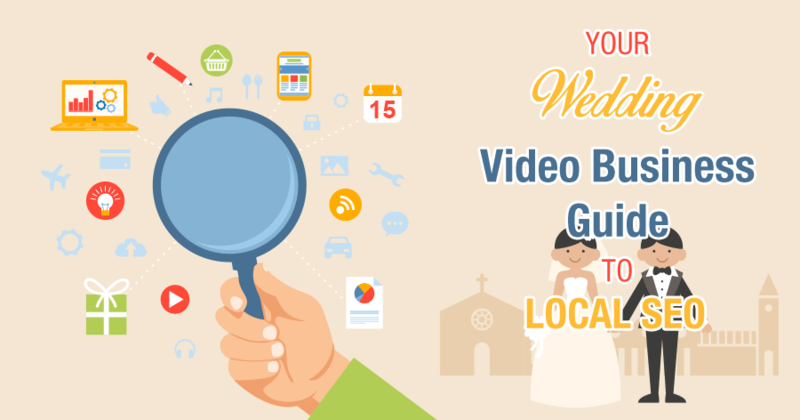 Type in your region along with the phrase “wedding videography”. Click the button on bottom called get search volume. The next page will give you results for that keyword.You can see that 30 people searched this keyword phrase and the competition is high. The level of competition is determined by how many people are optimizing their site for the same keywords. Google’s keyword planner does have a feature that gives you keyword ideas, but it doesn’t work as well as I would like. There are other free tools though that will provide us with a lot of similar keywords. In the next section, I am going to show you several tools on how find low competition keywords. Over time, Google adjusts its results to fit your personality. So that we can get accurate results, let’s change Google Chrome to incognito mode. Search “New York wedding videography’ and scroll down. At the bottom are keyword suggestions. Let’s put them back into Keyword Planner and see what results we get. 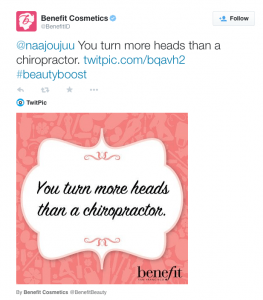 Unfortunately, all these keywords still have a high competition. Let’s move on to the next tool. After typing ‘New York wedding videography” we get the following results. Let’s take the relevant ones and put them into Keyword Planner. We’ve struck gold! 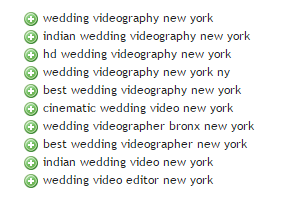 “Indian wedding videography New York” has a medium competition and “cinematic wedding video New York” has none at all. No competition means that none or close to zero people are optimizing their site for this keyword phrase. So if you used those keywords for your local SEO strategy, you would most likely show up on the first page. 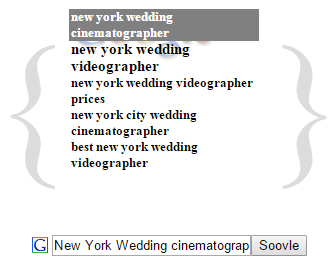 For some reason, Google didn’t show results for “New York wedding cinematographers”. I have a hunch that if we tried a different variation of that keyword, we would get results. Let’s try searching a different variation of it in our last tool. The last program we are going to use is Soovle. This tool starts creating longtail keywords as you type. So if I lived in New York I would first start with the low and medium competition keywords. 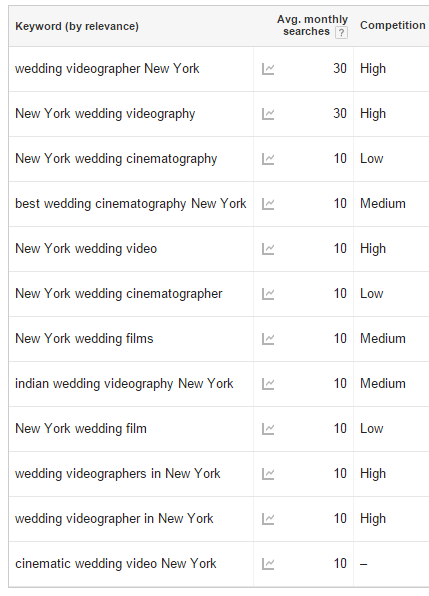 Like I said before, “cinematic wedding video New York” is the best to rank for local search engine optimization because no one is ranking for it. I hope that this tutorial was helpful. I challenge you to not just replaced your city with these keywords, but research and try to find some keyword phrases that are being searched. I have compiled a list of 150 low competitive keyword phrases for wedding videography. Insert your region or city into them and throw them into Google’s keyword planner. Even though keyword density plays into how Google determines which website goes on the first page, it will only take you so far. There are many other factors that Google takes into account. In future articles, I will discuss those other factors that will help improve your website’s local SEO and get ranked to the first page of Google. Post in the comments below any tips that have helped you get ranked higher on Google. A wedding video questionnaire is one of the most useful tools to have as a wedding videographer. This should be sent out to couples a month before the wedding. The more details you are aware of, the better prepared you’ll be to preserve it. Since you are prepared, you can focus more on being creative with your storytelling. What is your photographer’s phone number and email address? How many photographers will be photographing at your location? What time are your photographers arriving to the your location? What time do you plan to begin getting dressed? How many photographers will be shooting at your location? What time is/are the photographer(s) arriving to your location? Which individual will have possession of the wedding rings in the morning? What time are you planning on seeing each other for the first look? What are the logistics of your arrival to the first-look location? What time do you plan to end the photo shoot to prepare for the ceremony? Is the ceremony at a different location? List venue of the ceremony and the full address? How long will it take to travel from the first-look location to the ceremony? How are you and your bridal party traveling from the first-look location to the ceremony? On the invitation, what time does it say the wedding ceremony will BEGIN? What time does the Bride anticipate arriving to the location of the ceremony? What time does the Groom anticipate arriving to the location of the ceremony? What kind of ceremony are you holding? What the duration of the ceremony, approximately? How many wedding guests are giving a special poem, the scripture, or a statement readings? What day and time will the rehearsal be? What time are you planning on having the ceremony end? Are you planning on doing a receiving line after the ceremony? Are you organizing a special walk-out after the ceremony takes place? How are you traveling to the reception venue (if applicable)? What’s the travel duration to the next location (if applicable)? How much time did you plan for regarding the photo-taking plus travel time? What time are you wrapping up photo-taking to head to cocktail hour? towards the end of the photo shoot? When does cocktail hour begin? When does does cocktail hour end? When does the reception begin? When does the reception end? Will there be a special dessert display present at the reception? Who is going to be the emcee of the reception? Will there be lighting from the ceiling at the reception? Is the entertainment providing any services that contain photo like a photo booth? Is the entertainment company providing any services that contain video like slow motion booth? than his/her own designated setup area? Who is going to be the Maitre D’ of the event? Will there be a wedding coordinator? If so, provide their name. What time do you plan to cut your wedding cake? Are you having a traditional tossing ceremony? Take these questions and put them onto a google form and share it with your client. Make sure you don’t give them all the questions at one, but in small doses. Their details will help the day be less stressful and allow for you to focus more on your craft. For further resources check out Rob Adams Wedding Video Business Kit. If you enjoyed this extensive wedding video questionnaire, post a comment below. Check out my other article on 5 wedding video tips and tricks to marketing your wedding videography business on Facebook. Filming weddings can turn into a profitable business. Every year people are getting married. If you dying to shoot a wedding video, you’ve come to the right place. Follow this guide and you will learn some valuable wedding videography tips. Note: This article is more curated towards beginners, but there is marketing hack to get brides if you skip to step 4. Write notes on what you liked about them. Go and watch them again and take screenshots of the shots you like. Put those screenshots into a table in Microsoft Word. -Ask your friends on Facebook if you can borrow their video equipment. -Go to your church and borrow their audio gear. Next, you are going to need to find a second shooter. I would recommend find a wedding photographer that’s interested learning filmmaking. They already have the framing and composition, so they will be a fast learner. Go ahead and make a post on Craigslist stating that you are looking for a wedding photographer who wants to learn how to film weddings. Meet them at coffee shop and train them all the wedding videography tips you just learned. Google “(your city) engagement announcements” and look up weddings that are happening in the coming months. Google the church, find their phone number, and tell them to notify the couple that you will film their wedding for free. If you find that too obtrusive, go on Facebook and type “engaged people”. Facebook will show you everybody that is engaged starting with your friends and then your friends. Message them to see if they would be up for you filming their wedding. Once you get in contact with the couple, start by asking them how they met to form a connection. Their love story will help you figure out how to go about capturing their wedding day. A wedding video is not complete without a story. The vows, speeches, gift exchange, and first look all help to capture the essence of the couple’s love story. Also, do whatever you can to convince them to do a first look where they see each other before the ceremony. A first look is a gold coin in wedding videos. Once they have agreed that you can shoot their wedding and be able to use it as a portfolio piece, it might be good to have all the details under contract. Get a hold of the wedding planner. Have him or her send you the wedding schedule so that you know what is happening each hour. Figure out where the bride is going to be doing her prep. Make sure she is doing her makeup near a window. Natural light makes brides look their best. Also make sure she is sitting in a high chair. You have probably watched a ton of wedding films, but now it’s time to listen to stillmotion talk about the nitty gritty of filming a wedding video. Enjoy. Go to the rehearsal. I repeat, go to the rehearsal. It will save you a lot of heartache. On one of my shots that I attended, I discovered that I was not going to have permission to shoot inside of the church sanctuary. As a result of attending the rehearsal, I was able to plan accordingly and get permission to shoot not he balcony. This saved me a lot of stress when I had to film the actual wedding day. At this point, it is the day before the shoot. Go through your shot list and the wedding schedule with your photographer you picked up from craigslist. You want to be prepared as much as possible. Create a “don’t miss” list. Click here to see an example. Arrive to the location. You and your second shooter should separate and start filming the wedding. Ray Roman has a tutorial on staging. By this time you are exhausted. All the footage has been dumped to your computer. Now it’s time to edit. You can either edit on Premiere Pro or Final Cut Pro X. If you don’t have money, you can install a trial of Premiere Pro. If you are that one guy that doesn’t have a computer, go to the library and log on to wevideo.com. Wevideo is an online editing program that allows you to upload your footage to the cloud and edit off it. I would love to know if anyone does this. As you are editing, make sure you have added the bride and groom as your friends on Facebook. This will be important later. I recommend first editing the speeches and line them up in the sequence. Next, put the clips of all the cute moments at the wedding. You are probably going to be mad that a majority of the shots were out of focus, or you missed some key moments. It is ok. That is why you did this for free. I remember when I made my first wedding video. I only had enough good footage to put two minutes together for a wedding highlight film. Once you are finished, post it on Facebook, tag the couple and sit back and watch the views rise…. hopefully. I hope that these wedding videography tips help you to make a wedding video. When I got my first opportunity to film a wedding film, I knew right away shooting wedding videos was my passion. 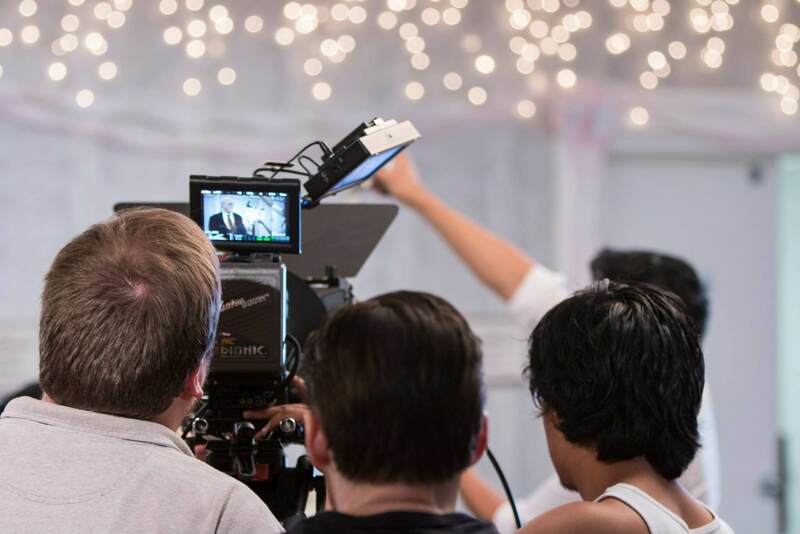 If you want to learn more, check out Kraig Adams at Wedding Film School. He has an entire Youtube channel how to how to make a wedding video. Post in the comments below any other advice that helped you start your own wedding videography business. 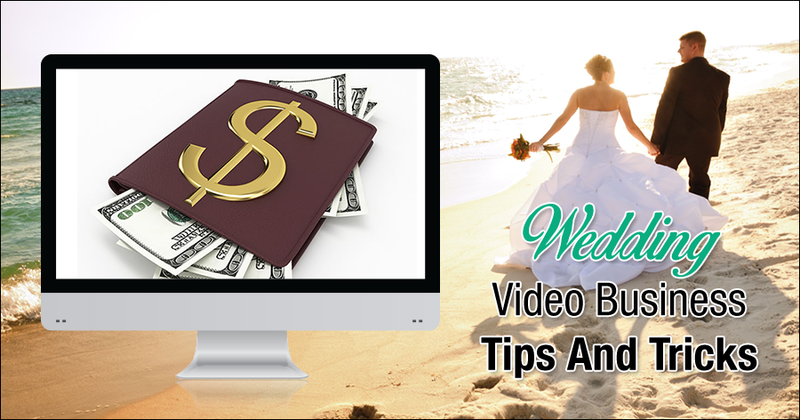 Check out my article on tips and tricks to market your wedding video business via Facebook. They use out of the box wedding videography tips and tricks to market their business via social media. Yes, your traffic explodes when a bride shares her wedding highlights film with her social network, but that shouldn’t be the only method of promoting. If you are wanting to learn how to do wedding videography, you have come to the right place. Part of running a business is knowing how to market it. Facebook has a lot of powerful features and it would be a waste if you didn’t use all their features to book more brides. In this guide, I will show you five ways of how to promote wedding cinematography business via Facebook. In Facebook’s search bar, individuals typically use it to search people’s names. Facebook’s best-kept secret is that you can use the search bar for other purposes. If you type “engaged people”, Facebook will show you everybody that is engaged starting with your friends and then friends of friends. This free technique is an effective method to spread awareness of your wedding video production company. Start messaging them and see who is looking for someone to film their wedding. This method is also good if your just starting out and looking for a couple you can shoot their wedding video for free. Instead of sending them to your channel to watch more of your wedding videos, you can add a tab that displays all of them. Add Youtube as an extra tab on your wedding video company’s fan page. I like to give several options for clients to contact me- either through my website, my phone number, email, and Facebook. Page Yourself has a neat tool where you can add an extra tab displaying a contact form. This app creates a new tab that allows brides to book their wedding video with you directly in the fan page. 22 Social allows for you to have a live Google hangout on your fan page. My favorite review app is the one that’s already installed into Facebook, because the star rating appears prominently on a fan page’s timeline. To turn on the Review app, go to settings, change the Facebook page category to Local Business, and then type your address in the About section. If you build relationships with photographers in your region, you are more likely to get referrals. Facebook gives an opportunity to take that first step. Your fan page can tag other fan pages in a post. Next time, boast about how awesome a particular wedding photographer is and tag them in it. They will receive a notification, and if their love tank gets filled, they will promote your wedding videography business as well. The posts made recipients pause for a moment and appreciate the compliment. It moved them to share the visual with their social network. When a girl goes shopping for makeup and see’s benefit she will trust the brand because she remembers her friend sharing a post about it. As wedding filmmakers, we have a demographic that loves this kind of content, so why not implement a similar visual campaign to your social media. This will result in you booking more brides for your wedding videography company. 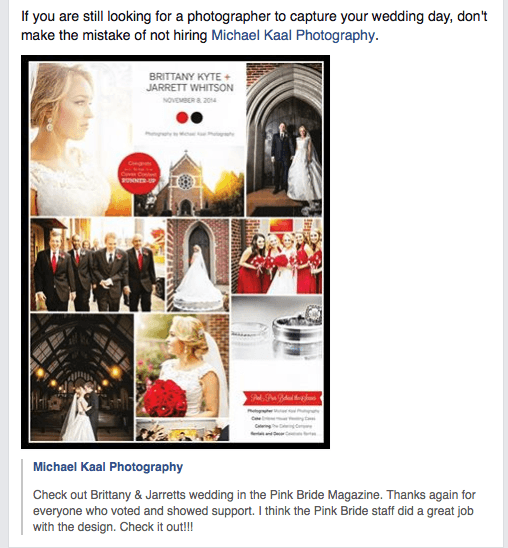 If you have ever tried using Facebook ads to promote your wedding cinematography business, you probably didn’t enjoy your experience. You paid $200 but got no leads. The reason behind this is because you didn’t include a lead magnet with your ad. On Facebook, you’ve probably noticed ads that say free ebook. You click on it, submit your email, and then the download gets sent to you. This technique is called lead magnet marketing. An excellent program called 22 Social allows you to create a lead capture page as an extra tab on your Facebook fan page for free. As brides scroll their Facebook feed, they will come across your ad “download free wedding checklist”. After clicking, they are brought to your lead capture page, which includes an opt-in form that sends them a free download via email. Their email gets imported into your MailChimp, and the download gets delivered. In the future, they will receive free content that can help them with their wedding planning. There you have it, five tips on how to promoting your wedding videography business. Please share this article with your colleagues and let me know in the comments if you use any other methods to market your wedding films on Facebook. Check out my article on 75 questions to ask be fore shooting a wedding video.